Welcome to our new website - this is work in progress so please bear with us! 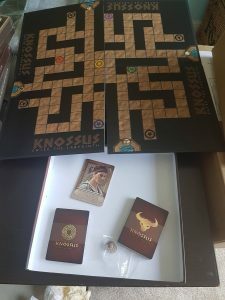 Following from the success of Knossus at UK Games Expo we decided to get a batch of first real print prototypes done. These differ from the playtest prototypes in that they are next best thing to a publishable game. We’re now aiming to get feedback not only on the playability of the game but the look and feel. So far we’re still using generic miniatures but – watch this space – we’ve found an amazing sculptor so next step, jaw dropping sculpting pics!